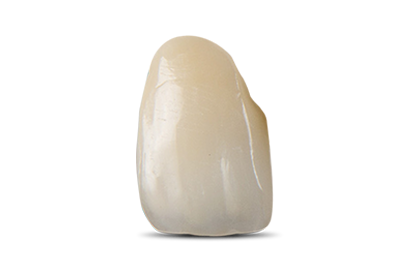 ZirTek™ MasterCraft PFZ is a highly esthetic Porcelain-Fused-to-Zirconia option which combines the amazing fracture resistance, cementability, and strength of zirconia with the versatility and lifelike esthetics of pressable ceramics. ZirTek™ MasterCraft PFZ restorations are CAD/CAM designed and milled by our expert technicians to have outstanding fracture resistance with 1100 MPa flexural strength. ZirTek™ MasterCraft PFZ offers an accurate level of fit, natural opalescence, and incredible translucency. Along with the rest of our ZirTek™ line of restorations, ZirTek™ MasterCraft PFZ has a lab turnaround time of 5 days and comes with a 7-year warranty.